I finally finished my prototype of a rechargeable LED Hula Hoop. 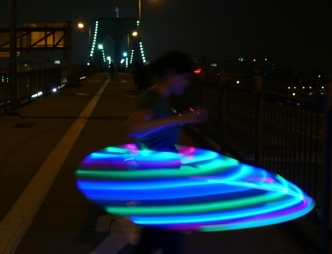 The hoop can run for 6 hours 3-5 hours, and is much brighter than a PSI hoop. And it only takes about 1 hour for a full charge compared to overnight in other models. The charger has a red and green indicator light to tell you when charging is complete. In this prototype the power switch is on the outer edge of the hoop just like the original kit and most other hoops. But the DC power jack is directly behind it on the inner edge. So both the switch and DC jack is on the same side of the connector. The wires run through the connector and the battery sits in the other end of the tube. This means the hoop is still collapsible for traveling. The other advantage is that once I make the rechargeable upgrade kit available you can upgrade your existing ProdMod Hula Hoop without making much of a change. It wont look much different and still maintain collapsability for traveling. Another plus is LEDs shine a lot brighter on this version than my original non-rechargeable kit. I will be unveiling this rechargeable prototype this Thursday in NYC at the Saatchi Gallery (375 Hudson Street) as a part of Internet Week NY. I’ll be there from 6:30 to 9pm. So please drop by and try it out, I would like your opinion on how it feels and how it is balanced. Detailed instructions to make your own rechargeable hula hoop and kit information will come soon. Subscribe to ProdMod ™ by Email so you get notified as soon as a new information comes out. 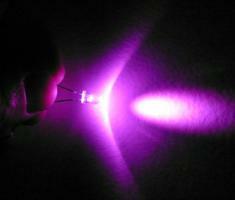 When will the kits with the rechargeable batteries be offered for sale? I was going to order a kit tonight, but then saw you had rechargeable ones forthcoming. How long will I have to wait to order? The rechargeable battery is unfortunately on back order with my vendor for at least 2 weeks. I will finalize pricing and post a buy button this weekend for pre-orders. I probably wont ship until early July. It would also be offered as a stand alone kit so people who already have the original hoop can upgrade. Subscribe to my site to get automatic updates.